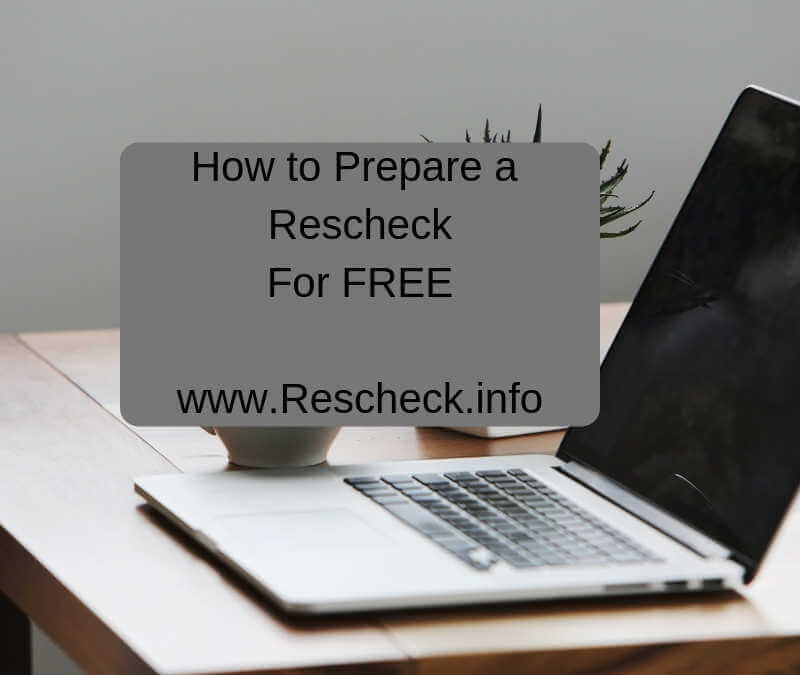 How to Prepare a Rescheck For FREE. | $79 RESchecks & Manual Js. $79 Any Plan. Any State. Today on the Reschexpert blog we want to discuss ways that you can obtain a Rescheck report without paying a dime. Our primary purpose and mission when starting our company was to help building departments sort through dozens of daily Reschecks and make sure they were done correctly. We eventually parlayed that into a business that creates low cost, fast turn around Reschecks, Manual Js, Manual Ss, and Manual Ds. However, we find that a large percentage of our Residential and Commercial energy audit clients can use our processes and calculations to become proficient in the underlying software themselves and ultimately begin creating free Reschecks for themselves, their company, their building department, or their practice. Your first step to understanding the process of creating a free Rescheck is to understand that you need something to Rescheck. An alteration, addition, or new home construction and the respective plans will work just fine. We suggest that you work off of a full size set of plans, because this gives you the piece of mind of having full size dimensions, white space on the plans with which to take detailed notes, and a copy of the plans to keep on file for future modifications or customer changes. If you only have a DWG or PDF head over to an office supply store, and for a few bucks they will be glad to run a full size set of your plans to Rescheck. Next, you are going to need a computer. A laptop or desktop is fine. Internet connection will be required. If you do not have a computer try a local library as this should be able to satisfy your need for a computer and internet connection. If you are a construction professional on the road without your home computer, then the hotel you are staying in probably has a business suite in the lobby that includes a free computer, fax machine, printer, and a speedy internet connection. This can be a great place to create free Reschecks, because it also includes free coffee, which we find essential for the loads of math involved with each Rescheck report. Your next step is going to be getting suited up with the proper software. The DOE has two current options that are highty respected and regarded as the epitome of well made energy audit software. These are Rescheck Web and Rescheck Desktop. The differences are that Rescheck Web operates over the cloud and is accessed online. Rescheck Desktop is downloaded to your hard drive and all your files are stored on your local laptop or desktop. Both have their advantages, but if you live in a world where you have an internet connection 99% of the time you will benefit greatly by using Rescheck Web. Rescheck Web allows you to share among team members, plus you can access your files anywhere there is an internet connection. The next time you submit for a permit you can literally walk in with your laptop and if your inspector suggests changes to your Rescheck you can make the modifications with him at his desk and walk over to the counter and obtain your building permit. We do this all the time. Rescheck Web is slick and sheen, and exactly what you should be learning on to create your free Rescheck. The calculations are your next step. You will need a calculator, spreadsheet, of a scratch sheet of paper that you can do math on for an extended period of time. Go ahead and start at your foundation. What type of foundation is it? If it is a slab measure the perimeter, if it is a basement or crawl you are going to need the sq ft of the wall and how far it buried underground. Break it into 4 sections of N, S, E, and W. Write this info down. Next move up to your walls and calculate total sq footage and break them into North, South, East, and West Exposures. Then look at the windows and doors on each respective wall and write down the dimensions. Finally, move to your roof and find the total insulated sq footage of this area. Find your R Values. Your plans probably have a page that shows the R values for each component. Go ahead and locate this. In the event that no R Values are specified you may have to do some detective work to find the minimum R values to pass a Rescheck for your climate zone. You can do this by entering an R value for the ceiling, walls, and foundation and doing some tweaking to find exactly which values are compatible with your construction systems and produce a passing score. Also make sure construction materials of that R Value are readily available in your local area. For example, it might be hard to find an R 49 ceiling batt in Houston, Austin, or San Antonio but easy to locate in an area like Denver, Fort Collins, or Boulder. Next look at your window systems, and find their U Value and SHGC. Certain states like Texas, Arizona, Florida, South Carolina, North Carolina and many others have minimum window specs, and if your average of glazed areas does not fall below these values, then you have serious issues. Make sure you find the right specs for your window system. After you have this data entered into your Rescheck software, you are ready to check compliance. You click to calculate, and your project passes, so it is now time to turn your report into to your building inspector and building department. Congratulations! 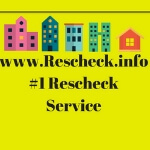 you have have just created your own first free Rescheck. If you do not have time to create the Rescheck yourself, we offer the next closest thing. We charge just $79 and we can have your Rescheck ready same day in 4-6 hours. Simply submit your plans by clicking the paperclip in the lower right of the screen. We will complete the Rescheck. Once it is ready we will send you a project recap and invoice. We also prepare Manual J, Manual D, and Manual S.